New Discussions of the Financial Crisis and the Recession help students see the relevance of economic models to what they are seeing in the news and perhaps experiencing in their own lives. New and Updated “Illustrating the Idea” and “Applying the Analysis” Pieces drive home central economic ideas in a student-oriented, real-world manner. New content includes the analysis of the effects of rising gas prices on companies like FedEx and Symantec,and an illustration of federal versus state and local spending. Consolidated Material on Wage Determination and Income Inequality and Poverty and moved online to provide more emphasis on core chapters and provide flexibility for customisation. 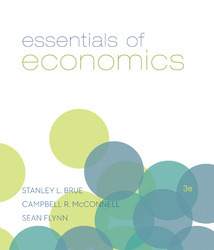 This convenient guide matches the units in Annual Editions: Economics, 37/e with the corresponding chapters in three of our best-selling McGraw-Hill Economics textbooks by Brue/McConnell/Flynn, Guell, and Schiller/Hill. An integrated eBook, allowing for anytime, anywhere access to the text. Dynamic links between problems or questions and the location in the eBook where that problem or question is covered. A powerful search function to pinpoint and connect key concepts. Extensive reporting across categories such as Learning Objectives, AACSB criteria, and Bloom's Taxonomy, among others. Topic-based LearnSmart Study Modules: LearnSmart's adaptive self-study technology within Connect provides students with a seamless combination of practice, assessment, and remediation for core concepts in the course. A Distinct and Unique Book; Not a “Cut and Paste” of McConnell/Brue/Flynn: Brue/McConnell/Flynn thoroughly reworks all topics so that chapter order, level of difficulty, and readability are more appropriate for the faster-paced essentials course. Many Real-World Examples: Brue/McConnell/Flynn places a strong emphasis on real-world examples. “Illustrating the Idea” features use analogies, examples, and anecdotes to illustrate theory. For example, public goods and the free-ride problem are illustrated by public art, while a pizza analogy walks students through the equity-efficiency tradeoff. In the essentials course where there is limited time to linger over topics, such discussions help students learn more quickly and breathe some life into what can otherwise be tedious discussions. Interesting, Memorable Applications: “Applying the Analysis” walk students through economic theories and ideas to cement comprehension. For example, the basics of the economic perspective are applied to why customers tend to try to wait in the shortest checkout lines. Differences in elasticity of supply are contrasted by the changing prices of antiques versus reproductions.